Abraham Maslow’s famous Hierarchy of Needs (1943, 1971) effectively describes the sequential levels of needs/goals of the emerging vMEMES. Eg: PURPLE wants to find safety in belonging; RED craves esteem; etc. As Maslow theorised mainly from case studies, rather than the kind of methodological research Clare W Graves undertook, it’s hardly surprising that his Hierarchy does not match exactly to Graves’ Spiral. However, the match is close enough – see the Comparison Map – for us to consider Maslowian concerns and principles from the perspective of vMEMES. By doing this, we see not the ‘theoretical needs’ so often associated in a rather abstracted way with Maslow’s Hierarchy but living neurological systems within us desperate to be fulfilled. Maslow’s Hierarchy is looked upon by a number of psychologists as a guide to ‘ideal mental health’. In other words, if an individual is able to progress up the Hierarchy, with their needs met at each level, then they will move beyond the lower subsistence/deficiency levels and start to meet their ‘growth needs’ and eventually their ‘being needs’. According to Marie Jahoda (1958), Self-Actualisation – YELLOW in Spiral Dynamics – is a key element of ideal mental health. In Gravesian terms, they will move beyond the limited visions of the 1st Tier and see through 2nd Tier lens. In Humanistic Psychology, this need to grow is termed the Actualising Tendency – which Don Beck (2002a) pretty much parallels in his concept of the Prime Directive. However, if someone becomes blocked at one level or the needs of a lower level are not met, then this will create problems. Blockage will lead to frustration of the individual’s psychological progress; having to attend to the needs of a lower level from a higher position in the Hierarchy/Spiral will inevitably produce significant behavioural changes, accompanied almost certainly by degrees of anxiety. For example, if the PURPLE love-and-belonging needs of a divorcing couple are shattered by their split-up, then that will tend to destabilise their RED’s pursuit of esteem at the next level. Prolonged stress, frustration and anxiety are all likely to lead to Depression. Don Beck (1998) has stated that each vMEME needs to be exercised regularly for it to be healthy – including but also transcending Maslow’s idea of needs being met. Correspondingly, suppression of a vMEME will lead to psychological problems. Of course, expression of a vMEME needs to be in a way which is healthy to the whole of the human Spiral. So, for example, if BLUE, in its need to establish orthodoxy and compliance, suppresses RED’s need for self-expression completely, this will cause all kinds of problems. Sigmunds Freud’s Psychoanalytic Theory (1923) can be useful here in understanding these vMEME conflicts. Freud’s Id is the basis of the individualistic side of Graves’ Spiral – the diversity generators, as Howard Bloom (1997) calls them. Freud’s growth of Ego-to-Superego relates to the collective side of the Spiral – Bloom’s conformity enforcers. Freud saw psychiatric disorders – at one level at least – as resulting from the conflict between the express-self Id (at its peak, RED) and the conform-to-expectations Superego (BLUE) when the Reality Principle of the Ego is unable to reconcile these two competing systems. To protect itself, the mindwill employ a number of defence mechanisms in the selfplex such as repression, displacement, denial and intellectualisation. However, the suppressed problem is likely ‘leak’ through, perhaps in disturbing dreams and/or abnormal or depressed behaviour. Reframe Freud’s ideas in terms of Graves’ Spiral and it becomes more than possible that vMEME conflicts do indeed contribute to psychological disorders, with overdominance of the collective side’s conformity enforcers able to push some into acute anxiety and even Depression. However, it is not only express-self vs sacrifice-self/conformity which provides a platform for vMEME conflicts. Sense of time can be a stimulus for conflict on the same side of the Spiral. In this kind of scenario, RED, living just for now, could find itself in conflict with ORANGE’s wanting to plan for the future – leading to anxiety. Equally the tradition-oriented thinking in PURPLE will find it hard to grasp the future-focused ecological concerns of GREEN, again leading to anxiety. 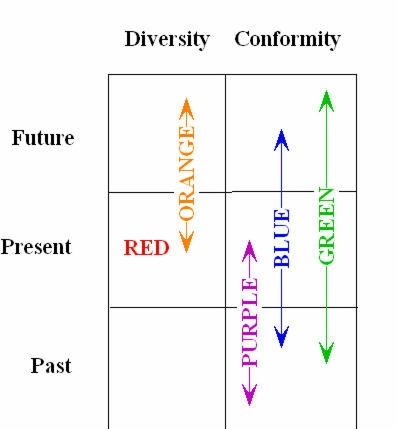 Taking this argument further, what kind of anxiety or other mental problems could arise when vMEME conflict is both across sense of time and express-self vs conformity -eg: ORANGE future-focused/express-self conflicting with PURPLE tradition-oriented/conformist? So far, we’ve looked at vMEMES as contributing to the creation of cognitive diatheses and their conflicting needs creating anxiety at a cognitive level. We’ve also looked at biological diatheses, some of which may hinder the functioning or even development of vMEMES and, thus, the ability to cope with adverse life conditions. What about when a negative cognitive pattern becomes locked with a biological diathesis? Earlier we mentioned Hans J Eysenck’s Dimensions of Temperament construct, in which the naturally Melancholic personality is created by high Neuroticism being mixed with high Introversion. We also noted that the self-sacrifice/conformity-oriented vMEMES are more likely to lead to the creation of depressive schemas. What if such a vMEME locks into a Melancholic personality? So, if BLUE can fit with Melancholic to create Compliance, can they also fit together to create a bio-cognitive diathesis, waiting for its stress trigger? The PURPLE-Phlegmatic fit to create Submission hardly bodes well for a successful approach to problems either! It’s interesting that, in his work on Attribution Theory, Julian B Rotter (1966) hypothesised that there is a biological basis (Melancholic or Phlegmatic temperament?) to whether someone tends to have an internal or external locus of control, finding that people with an external locus – ie: they generally feel events are out of their control – tend to indulge in much more negative self-talk (meta-stating from the effects of self-sacrifice/conformist vMEMES?). Aaron T Beck’s (1967) ‘sociotropic personality’ fits to some degree with this concept – Beck’s sociotropic’s needing the approval of others. (Thus, a snub from somebody deemed to be ‘important’ might instigate depressive thoughts.) However, Beck’s ‘autonomous personality’ might also be vulnerable if their self-esteem were to be undermined. (Eg: losing a game of tennis or having a work decision overruled.) The sociotropic’s PURPLE seeks approval and acceptance while the RED of the autonomous is focused on doing what it wants to do and avoiding restrictions – and especially shame. Simply by considering both Rotter’s and Beck’s concepts, we can begin to see just how complex temperamental and motivational interactions are. Just how convoluted the bio-cognitive relationship may be is reflected in that both Graves and Maslow declared that the 7th level of thinking (G-T/YELLOW or Self-Actualisation) is effectively free of fear – associated with Neuroticism and the producer of anxiety. So maybe there is something in the idea that working up the Hierarchy/Spiral – life conditions permitting – is conducive to good mental health…? These are early thoughts and, in a sense, quite simplistic. I have not attempted to look at how vMEME harmonics or transition states might influence any of these elements. (For example, one of the characteristics of the RED/BLUE transition is the development of shame and guilt.) Nor have I really considered social/societal factors and especially the enormous pressures that social roles can impose upon the individual. My intention in publishing this article is to raise possibilities and probabilities as an argument for further research. The Gravesian approach and its Spiral Dynamics and Spiral Dynamics integral builds have been rather overlooked by Psychiatry and Clinical Psychology and it seems critical to me that the Gravesian systems should be studied in relation to psychopathological disorders. The current crop of drugs do provide powerful treatments for many forms of mental illness – and even more effective drugs are known to be in the pipeline. (It may even be that a tryptophan-enhanced diet will help some depressives!) However, drugs can produce some pretty unpleasant side-effects and the ‘patient’ may become ill again when treatment is discontinued. There may be no real alternative to drug therapy for Endogenous Depression and other forms of mental illness such as Schizophrenia; but, if there are both cognitive and biological diatheses to develop other forms of Depression, then drugs may not be so appropriate in the longer term and we need to look at the coping mechanisms for the life conditions. Over the years a number of psychotherapies have been used in treating mental illness – from classic Psychoanalysis to Cognitive-Behavioural Therapy. Different psychotherapies seem to work for different people at different times. None so far works consistently across the board – even for a single classification of illness. If we are to take the treatments forward beyond an ever-increasing dependency on drug therapy, then we need to understand how core motivational systems (vMEMES) affect people in ways which can lead to mental illness. It is also clear from our brief survey of Depression that no one cause can explain all instances of the illness; and, in many cases, the symptoms may be the consequences of multiple factors. The factor common to almost all instances – and almost always ignored! – is the effect of vMEMES. After all, what is more important in someone’s psychology than their motivation(s)? NB: This is the sixth revision of ‘Can vMEMES cause Clinical Depression?’ since its original posting in August 2004. The intention is not, as such, to produce an academic paper linking vMEMES to Clinical Depression. The intention is to speculate on how the concept of vMEMES can be woven into some of the major theories about the causes of Depression. This then justifies my call for those with the facilities to do so to undertake serious research around the potential relationship between vMEMES and causes of Depression and other ‘mental illnesses’. My thanks to Barbara N Brown, Hilde Rapp, Rob Geurtsen, Bill Hajdu and Jon Freeman whose comments and critiquing have helped shape previous revisions. To be serious, there is a lot you bring up. I’ve never thought about depression specifically in terms of Spiral Dynamics. I’ve always assumed depression is caused by many factors and no doubt vmemes would be included. I understand how it theoretically connects, but I’d have to consider it more deeply to understand how it might apply to my own experience. Thanks for sharing yor personal experience. I’m very drawn to the relationship between the subjective and objective, the personal and interpersonal… and that is why psychology is one of my favorite subjects. I read your article. The ending part caught my attention. That seems true to me. I’ve had some deep lows where my mind shifted into a different way of processing, but I couldn’t explain why or how the switch occurred. It felt like a natural shift a psychological mechanism rather than something being consciously chosen. It couldn’t be consciously chosen because it couldn’t be predicted. The shifted state of mind couldn’t be comprehended from the previous state. I tend to agree with the view that problems can’t be solved on the level they were created. However, Adaptation is important as well. Not all problems require major shifts. To some extent, life is about simply taking stock of where one is in the scheme of things. I liked that you pointed out the connection of vmemes and temperaments. I suspect that the most profound shifts begin with acceptance, but of course the conflict of unacceptance can cause the most dramatic shifts… if drama is what one desires. To answer the questions in your last paragraph…. I’ve been interested in the behavioural sciences most of my adult life – especially Psychology – though I suppose, for 10-15 years altogether, I got distracted into organisational systems. The turning point for me came in 98 when I was trained in Spiral Dynamics by Don Beck & Chris Cowan. At the time I was in a real mess psychologically – not depressed as such; but seriously stressed. A couple of years before I’d been similarly stressed and had a ‘nervous breakdown’ (actually an acute anxiety reaction). For more on that and my recovery see 1989-96 in my Career section. Spiral Dynamics was a transformational experience for me. If you refer to my article, The Process of Change – see: http://www.integratedsociopsychology.net/articles/the-process-of-change/ – I was in a Gamma Trap and I experienced a Quantum Leap – a Bateson Level 3 change. I’ve never seen the world in the same way since. Spiral Dynamics became the structure with which I could pretty well reconcile everything in the behavioural sciences – hence: Integrated SocioPsychology. It was around 3 or 4 years ago, with a client in therapy, that I found none of my NLP tricks using the Spiral map worked. Baffled and frustrated, I turned to the bete noire of my university days, the then-reviled Hans Eysenck to understand how innate temperament affected thoughts and behaviour and that led me into learning a little CBT. Since my client’s problems were rooted in innate temperament, CBT was actually a better tool for that person than anything NLP. So that’s how I arrived at my two prime emphasises – motivation (SD) and temperament (PEN). As to Can vMEMES cause Clinical Depression… It’s been revised 3 times since – and I’m still not entirely happy with it. There’s something not quite there…and I’m not sure what it is. But, in the meantime, if it helps stimulate discussion…. At the time I wrote the first version in 2004, I’d just finished my first year of teaching A-Level (pre-university level) Psychology and had been covering different explanations of Depression. That had been a frustrating experience because the exam board specification didn’t really allow me to bring in Graves/SD. But, as soon as I started getting to grips with Fritz Heider’s Atribution Theory and Aaron Beck’s Cognitive Triad, it became clear to me that the cooler vMEMES tend to attribute in a manner which, in its extremes, would be highly negative and self-critical. It was about a year or so after that I returned to Eysenck and started bringing in the biological stuff. Yeah, bravery…. maybe but I wouldn’t think of it that way. I just don’t ever entirely separate my personal experience from my trying to understand the larger world… afterall, in reality they’re not separate. It would seem silly to me to hide my depression. It’s just a fact of my life. If I hadn’t come to terms with my depression after having it for a couple of decades, then I’d consider that a sad state of affairs. I share my depression in the way I share anything else that I personally know about. I’m sure I have a different perspective on this than you. I’m just someone who likes to try to understand the world, but beyond that I have no grand aspirations. I’m not academically educated in any of this and it doesn’t relate to the work I do to pay the bills. I just find it important to try to understand the world. As a depressed person, it give me a sense of meaning and purpose. It gets me up in the morning. I’m open to further discussion if you or Barbara Brown wish to continue it. BTW I’d be particularly interested to know your interest in this subject. How’d you come to know about these ideas? Is there a personal reason that motivates your learning about it? Has Spiral Dynamics been helpful for you in your life or your work? And if you don’t mind me asking, what is your reason for bringing up depression in this post? Firstly, Benjamin, thank you for your bravery – if that’s the right word – in discussing your own sitution. I’m a firm believer that disclosure of problems in the appropriate circumstances can enable others to come out with their problems. I’ve had a quick scan of the links you’ve put in and I need to give them more attention. Especially the one mapping the Galenic humours to MBTI concepts. Very interesting. I’ve also sent out a call to Barbara N Brown – whose e-mail to me originally kicked this discussion off – in the hope that she’ll join in. Very much a big thinker who can add much to this revived discussion. I’ll respond to the depression part of your comment first. For me, depression probably has a genetic component. I know one of my brothers was on anti-depressants for a time and I think the other might’ve been as well. My dad and his brother have been on anti-depressants in the past. My mom’s side of the family seems like a rather depressed bunch of people even though they’re not the types to seek treatment. I don’t know to what degree it would be genetics or else maybe learned behavior. I’m probably the most depressed person in my immediate family, but I don’t specifically know why. I’ve always had issues with fitting in and struggled with learning disability quite a bit when younger. I often have the sense my brain doesn’t function in a typical manner, but heck if I know. I’ve been on medications before and they help a little. I was looking at statistics relating to depression and Myers-Briggs. I don’t know about Eysenck’s data, but MBTI shows only around 20-30% of the population as Introverted with over 80% of the depressed being Introverted. Types with Intuition function are also less common than those wth Sensation function. INFPs are a small percentage of the population. But Introversion, Intuition and Feeling are most represented among the depressed. And INFPs are the type most likely to have suicidal thoughts in college. In relation to chronic pain, INFPs showed the highest depression of all types. Along with INTPs, INFPs report the most dissatisfaction with work. And if an INFP is a male, he is atypical with 76% of women as feeling types and 57% men as thinking types. I was doing some other websearches. There are a number of articles that that discuss Eysenck, Kiersey and Berens in terms of Temperaments. I don’t know if there is any similarity between how Eysenck and Kiersey wrote about Temperaments. The two were coming from different directions. As regards persistent Depression, then much as it might gall, it might be we have to look at biochemical defecits – especially low levels of serotonin – and genetic predispositions. In which case, some level of medication may be necessary. I actually attach a lot of importance to the Diathesis-Stress approach. There don’t seem to be that many people suffering long-term from what would be termed purely Reactive/Exogenous Depression. In which case, there’s a lot to be said for considering biological and/or cognitive predispositions and teaching people to cope with life better so they don’t trigger those predispositions. Which may bring us back to what you’ve been saying about cultural/societal pressures….? Hello Keith. I’m glad you responded to this old post. A good discussion never grows old. I’m interested in any model of personality. It’s all good to me. I’m most well read with Myers-Briggs for a few reasons. It originated from Jung’s typology and I love all things Jungian. There is a vast literature about it. It’s actively discussed online and widely used by therapists. It has had a fair amount of research done on it and it’s been correlated with numerous other personality measures (from traits theories to boundary types). I know a little bit about Eysenck and traits theory in general. Many people on MBTI discussion boards are also interested in traits theory. Much of the research crosses over with Myers-Briggs. If I remember correctly, Eysenck may have done some factor analysis that demonstrated correlation with Meyers-Briggs. The two systems aren’t too different especially when you consider MBTI Step II which creates something similar as what is done in traits theory by using factor analysis (5 subscales within each function and attitude). Mostly their difference is in how they’re often used. Traits theory is grounded more in academic research and Myers-Briggs is grounded more in practical application. Also, I have some interest in Kiesey’s temperaments partly just as a different perspective. He uses MBTI language although in a very unique way not intended by the creators of MBTI. Even more interesting, Linda V. Berens created Interaction Styles which is a cross-breeding of Kiersey’s temperaments and other models such as DISC. It was her work that made me consider more seriously Kiersey’s model, but I’m less certain about Kiersey and Berens because I’m not sure how much research has been done. And I know of DISC primarily through Berens. As you can see, I’m quite interested in where different models potentially corroborate eachother. I’m very interested in theory because it brings some order to the chaos of data, but I’m willing to go wherever the data takes me. Most recently, I’ve been returning to Ernest Hartmann’s thin and thick boundary types. Are you familiar with his work? It’s a simpler model as it’s just focused on one aspect, but it seems to explain an important distinction. It’s been informing my recent thoughts about political identification. I’ve taken official tests and come up as an INFP. It was no surprise. I’ve experienced depression for much of my life and so have been interested in the reasons behind it. As an Introvert, I do think there is a connection there if only in the more Extraverted American culture. My parents have taken informal tests and come up as TJ types (Thinking Judging). They’re both fairly successful. They’re both able to fit in easily but also are more contented to live up to societal expectations. Many of the INFPs I’ve talked to value more highly their individuality and aren’t very career-oriented. It’s mostly speculation, but I’d love to see some more research into this area. Have you looked into generations theories. I see my generational cohort as having a major influence on my attitude towards life. I’ve wondered how generational attitudes might interact with spiral dynamics. Would a generational cohort tend to align itself with a paticular vmeme? Thank you for resurrecting this thread with such an interesting contribution. Personally, I know only the basics of Myers-Briggs. Being something of an empericist, I long ago took the decision to favour the Eysenck PEN model of temperament – see http://www.integratedsociopsychology.net/theory/dimensions-of-temperament/ – as I felt it was more robust than either Jung/MBTI or the Cattell-derived ‘Big 5′. Both Eysenck and Graves map pretty well into William Moulton Marston’s DISC types of behaviour and I tend to see these as ‘centres of gravity’ where a vMEME locks into a temperamental type that suits – eg: PURPLE with Phlegmatic, RED with both Choleric and Psychoticist. As far as I know the relationship between temperament and motivation is dreadfully under-researched. (Someone please prove me wrong!) Off the top of my head, I know of only one salient piece and that has never been officially published(!!!!) – N N Trauel (1961) – quoted in Eysenck (1967) – found extraverts to be significantly less conformng than introverts. As to whether culturally-disapproved temperaments can risk Depression…. Very interesting! Imagine a highly-extrovert child being suppressed in a middle-class Victorian household…a highly-neurotic soldier going over the top in World War I…or today it is increasingly being acknowledged that introverted youngsters tend to be the ignored ones in classroom where the extraverts, whether for good or for bad reasons, tend to get all the attention. I enjoy any model of human psychology and behavior. Spiral Dynamics and Myers-Briggs happen to be two of my favorites. I’ve always thought they were connected, but this is the first time I’ve seen anyone else make the connection. I’ve wondered if particular vmemes would emphasize particular functions or types. Some Myers-Briggs theorists see that different cultures favor different types and maybe vmemes could give justification for why this might be the case. If your personality type is different from the culturally favored type, then that would be a definite cause for depression. Unfortunately, we are mostly voices in the wilderness. The psychiatric establishment has strong economic reasons for discounting what we say. If we’re correct, a lot of what they get paid to do can’t possibly help people because it goes against the person’s innate nature. What’s interesting is that approaches that assume the innate nature is normal and help a person adjust to being out of step with societal norms are often more productive in the social dysfunction/neurosis areas at least. In my most cynical mode, not only will they get less business if we’re right, they may be liable for huge class action law suites in the US because they ignored this research and therefore knowingly provided patients inferior treatment. Like you, my background is in hard science, with a career in engineering and IT project management. I did a minor in psychology as an undergrad, but the place was awash in behavioralists idiots who were doing really bad research in an attempt to prove “tabla rosa”. Since nature plays a big part, you had to mess with the research to get any kind of a huge nurture result, so most of them did the “you find what you look for” that skewed results. I stumbled on this ressearch because I’m both a rare personality type and out of step on my vMeme development. When I first started work, I found good technology didn’t get done for financial reasons. After working on an MBA, I also discovered it wasn’t just the money – the people got in the way. That set me on a quest to solve the people side of the issue. I found the Myers-Briggs folks and that led me to Kegan and then to Don. Sure says something for the integral approach. The article is partly aimed at mental health researchers but it isn’t intended to produce an alternate theory of Major Depression as such and it isn’t intended to be a ‘paper’. So I don’t feel the need to litter it with references. It’s simply to say that, if the mental health researchers were to go down the route of looking at Graves’ ideas, they might find some new concepts that actually tie in pretty well with existing theories. It’s an appeal for someone in the academic communities to actually start looking at this stuff seriously – and that’s all part of my campaign to get academia to validate Graves. (See the interview with Jerry Coursen – http://www.integratedsociopsychology.net/articles/jerry-coursen-on-clare-w-graves/ – for more of mine and his ideas on that!) It’s also aimed at SDers who, from the e-lists at least, seem to have a great apptitude for intellectual masturbation. So, the idea, is to show that by simply connecting up a few ideas, we actually can take SD/etc into the ‘real world’ and make a difference – eg: to people with mental health problems. Interestingly enough, the day I posted the article, I got an e-mail from someone suffering from Depression who wants me to do some therapy with her! Just some quick feedback: bold effort! Who is it aimed at? I am full of sympathy for you regarding the difficulaty of the task… (I continually struggle myself with the impossible task of identifying lines of enquiry, integrating bodies of knowledge etc ) Think Yellow- Turquoise in order to situate your own work- look at the overall context- and then look at the prevailing vmeme set of your target audience… For instance: if you want to attract a clinical / academic/ research audience you would need to provide full references. Very interesting. A lot of good points. There are a few Myers-Briggs researchers who think they have evidence that the specific type of psychological dysfunction has to do with innate temperament. David Kiersey has done some research on that. You can see his site at http://www.keirsey.com. A lot of the Myers-Briggs researchers think that many psychologists make neuroses worse by telling people that their natural way of interacting with the world is somehow defective. This particular Jungian group thinks we would be better off accepting people’s natural strengths and then if someone’s base personality is at odds with social preferences we can give them explicit coping skills to minimize the negative consequences instead of trying to force them to change who they are to be like everybody else.